Tostock is in what I understand planners call the 'sleeve' of the A14; but the traffic noise is absorbed by the woodlands, and there is no direct exit off of the dual cariageway into the village. And so, you wouldn't know, and this is a peaceful place. St Andrew is doubly peaceful, set as it is near to the brown sign tourist trap of St Mary, Woolpit. Not many people visit St Andrew; and yet, it is kept open, and St Andrew has an interior which is nearly as interesting as that of Woolpit's mighty church. Tostock escaped the grand Perpendicular rebuild that just about every neighbouring church underwent, and so appears less dramatic, but more homely, in its graveyard clearing. Externally, much of the church was as it is now in the 14th century.You step into an interior which appears wholly Victorianised, although there are some splendid medieval survivals. The first that you'll notice are the medieval benches, with their animal bench ends. When you look at the style, especially with the traceried backs, they seem so similar to those at Woolpit that you'll assume they came from the same workshop, and even wonder if they were once in the same church. The font is a pattern book of Decorated windows, but look out for the green man peering out of the foliage on the north face. I'm not sure what William Dowsing thought of it - he may have missed it. He came this way on the afternoon of February 5th 1644, and smashed 16 panes of stained glass because of the Catholic imagery they contained. 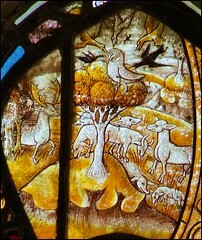 He gave orders for another 40 to be destroyed, but three rather pretty groups of fragments have been reset in the east window, showing a group of animals. Perhaps they were found during the 19th century restoration. Dowsing also ordered the steps up to the chancel to be levelled - these had been put in about ten years before under the orders of Bishop Wren, a staunch supporter of Laudian sacramentalism. An inscription asking for prayers for the dead was destroyed - Dowsing uses the word took, so it was probably in brass. As John Blatchly observes in the new edition of Dowsing's journal, it is unlikely that he was responsible for the damage to the bench ends, since they are all animals; as at Woolpit, which he also visited. The roof is superb. It reminds me of Rougham, if on a smaller scale, with the angels on the hammerbeams and figures in the wallposts. Like Rougham, it isn't as beautiful as Woolpit; but then, it hasn't been restored so enthusiastically. The war memorial set in the alcove to the south of the chancel arch is an extraordinary thing. Mortlock thought that the alcove itself had once been for an image to a chantry altar. I liked St Andrew very much. 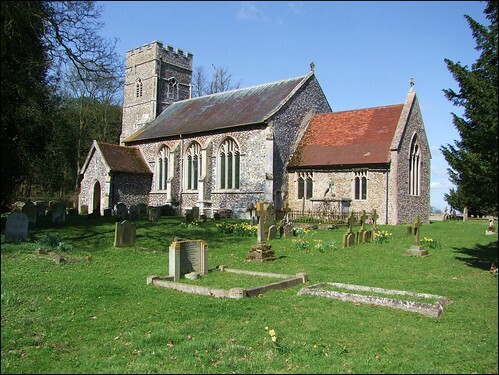 This church, and its village, are restful oases in a busy part of Suffolk, and in a busy world.